Expand your business like never before! Ready to build a burger dynasty? 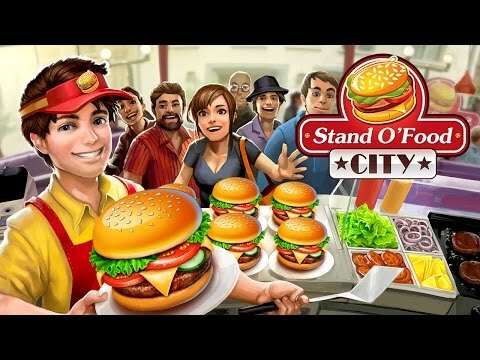 Stand O’ Food City, the free-to-play time management game based on our popular Stand O’ Food franchise, is here! Your old friends Ronnie, Nikki and Clarence have traveled from Tinseltown to open new restaurants. But the evil Mr. Torg is trying to destroy the hard-working team’s plans per usual! In this unique blend of time management, city building and strategy gameplay, grow your burger business step-by-step. Flip the best burgers, improve your offerings and satisfy your growing clientele. Then expand to seven types of cafes serving different specialties: lasagna, beef, fish, salad, chicken burgers, breakfast and chocolate cake. Make upgrades and maximize profits! Next, construct homes to grow the neighborhood, create farms and factories to source ingredients and add thoughtful amenities, such as drinking fountains. From the mountains to the beach, open new locations while unlocking recipes and perfecting sauces. Knock out hundreds of quests to earn achievements, rewards and a veritable fortune! Stand O’ Food® City: Virtual Frenzy © 2014 - 2019 G5 Holdings Limited. Published by G5 Entertainment AB. Stand O’ Food® City: Virtual Frenzy, G5 Games and G5 Entertainment are registered trademarks of G5 Entertainment AB.